I was the kind of person who would wear nail polish as per the color of the dress. But as the time passes by my taste changes (Read makeup and nail polish bug bit me!) and I started wearing nail varnishes as per the occasion, trend or season. 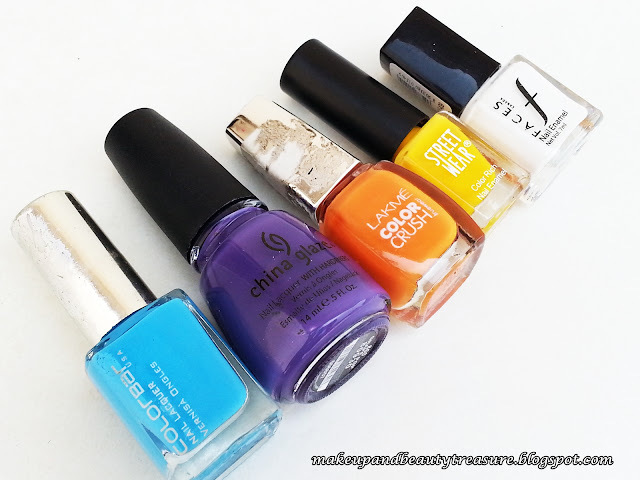 I like bright and matte polishes in summers as opposed to pastels and light colored ones. 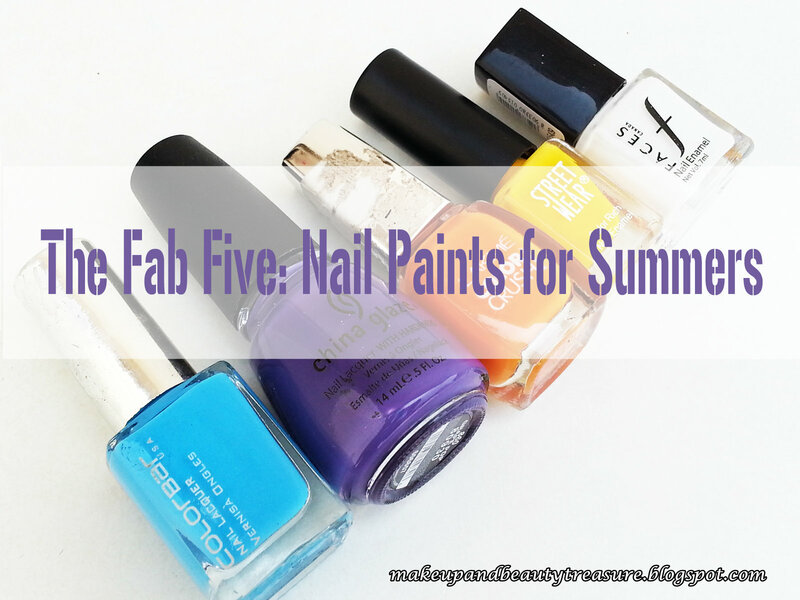 I chose these five nail paints that I would wear more often in this hot season. 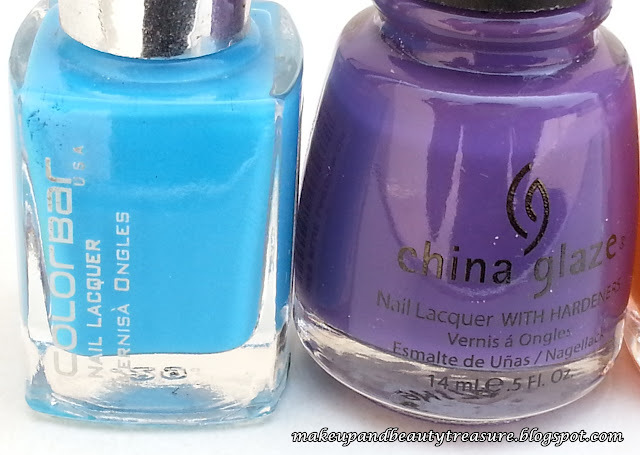 I have always been fond of blue colors and when I saw this beautiful, refreshing shade I immediately picked it up. Blue lagoon is a beautiful sky blue color with a creamy and glossy finish. It looks funky and chic on my nails. It works great for nail arts too. You can check out my leopard nail art here. You just need two coats of this polish to get an opaque coverage. It is priced at 150 INR for 9ml. Purple is that one color that flatters fairness (Believe me I look fairer in purple, black and maroon than in any other color!). 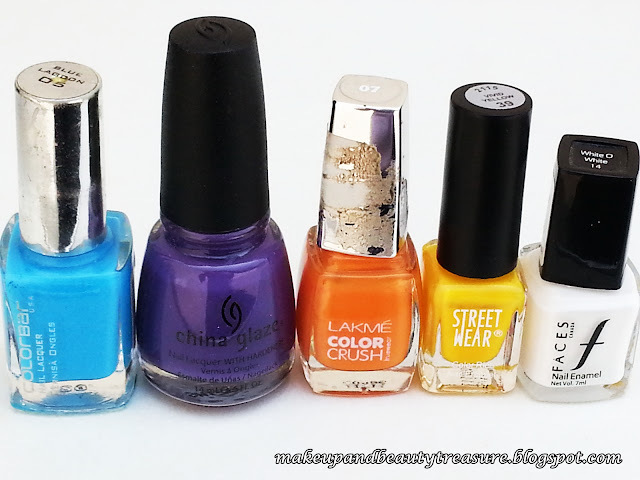 China glaze polishes are a bit pricey (I won this on style craze!) but they do have superb formula and pigmentation. Grape pop is a muted purple color with hints of grey. It goes completely opaque in two coats and delivers creamy and glossy finish. It is a perfect shade for spring/summer. It is priced at 500 INR for 14ml. I actually got scared of this orange shade when I first saw it but it looks good on nails. The shade 07 is a bright and funky orange shade with a creamy and glossy finish. It goes opaque in three coats. It looks flattering on fair skin tones. It is priced at 125 INR for 9ml. Yellow color always remind me of my school days when we used to tease our friends “Yellow Yellow Dirty Fellow”. I do not have a huge liking for yellow color but it looks really chic and funky in summers. Vivid yellow is indeed a bright yellow shade with glossy finish. Somehow I feel it makes my hands look dull and dark but looks chic with a nail art. You can check out my nail art with this nail paint here. It goes opaque in two coats. It is priced at 50 INR for 5ml. White is the color which never goes wrong with nail arts. 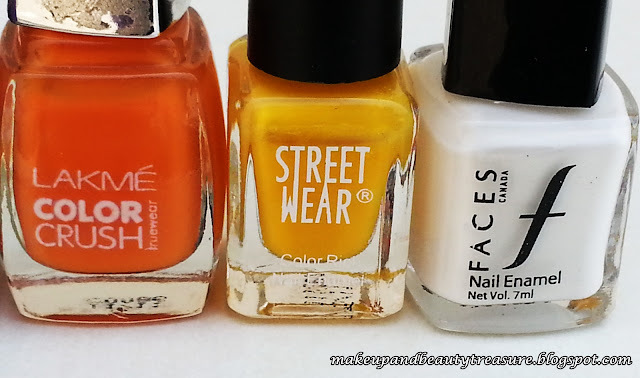 I had already reviewed Faces Canada Nail Enamel here. White o white is a pure white color with no hints of yellow. It gives a matte and glossy finish with two coats. It is priced at 99 INR for 7ml. What are your favorite nail colors or nail paints for summers? Share in the comments section below! Mine favs r yellow orange n blue n yes green too..
Colorbar Nail Lacquer in Blue Lagoon looks great! Yeah its a nice shade! Yeah both are fab shades! Awesome post Megha..Hope you are doing great. Yeah i am doing good. How r u? I want all of them! All are so attractive! Yeah i love bright shades! Perfect summer picks - great job megha :) those shades are really hard to resists..!! Lovely colours! I like the Street Wear yellow. Have never tried Street Wear, but I think I will try some now. Thanks! Ohhh.....i simply love all of them.... so attractive to look at! Can you please let me know where can i find China glaze nail paints. thanks. I loved your choice (he he also bcz I have 4 of them n they are my choice too :P ).